This charming and relaxing experience awaits you when you stay at The Willows Victorian Inn in the rustic Maine beach area of historic York. The Willows, built in the 1800's, is a beautiful Victorian home with architecture that echoes an era long gone by. Rich in tradition and elegance, The Willows reflects the best of Old New England. This Maine inn, which was previously a Bed and Breakfast, is now available exclusively for weekly vacation rentals. Great for Maine family vacations, family reunions, weddings or any other special occasion. 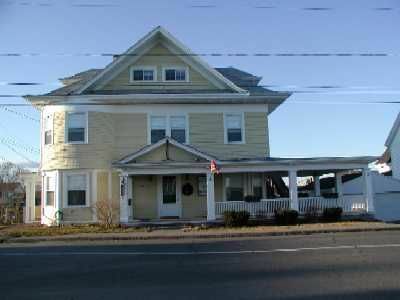 Nine immaculate and spacious bedrooms adorn this Maine Inn Rental, with queen-size beds accommodate guests; five have private baths, two share an old-fashioned bath with lion-clawed tub and shower and skylight and our two-bedroom suite with adjoining bath is popular. This Maine vacation rental is conveniently located within an hour's drive of Boston, MA, Manchester, NH and Portland, ME, serving all the major airlines. The Willows is non-smoking. We stayed here over Thanksgiving and had a wonderful time! There were 14 of us, a combination of families, and we found that we were able to cook our meal and enjoy it all together at two large tables in the dining room. The rooms were lovely and almost every one had its own bathroom. When we were not eating, we spent a lot of time walking around the area, which is quite beautiful. The house is proximate to the small downtown area, a beach, and a gorgeous lighthouse. Town was quiet, but that was fine. It was an easy drive to the grocery store when we had to stock up again. There is also parking for multiple cars. We really wished that there had been a warm spell so that we could enjoy the porch, but, alas, it was a very cold Thanksgiving. Kevin, the host, lives downstairs and was readily available when we had questions. He also kindly found and put on the side porch for pick up a walking stick that had been left behind. Close to beach and lots of room. Great place for large families. Had a great time. Will return someday! This house is perfect for a large group! We had several families with a total of 5 kids and there was plenty of space for everyone. Having so many bathrooms in the house helped solve a lot of logistics issues, and there was plenty of common and dining space for everyone to be together. The house is also in a beautiful location right on the water, but likely requires a drive to get to a good beach. I would strongly recommend for large groups! Our stay was wonderful! We truly enjoyed being so close to the beach and Kevin and Amanda were so incredibly hospitable! They Got or helped us with anything we needed! (And that was a LOT, considering there were 19 of us).Enough rooms and showers to host 19 people and plenty of space to eat and chill! We thoroughly enjoyed being at this beautiful Victorian Inn! We would stay here again!! The house was perfect for our large group that was in town for our wedding. The location was ideal for beach access and downtown restaurants, bars and attractions. The house was HUGE and the rooms were spacious and offered many bathrooms so no one was in each other's way. Kevin was a great host and was easy to contact to ask any questions and eager to help in any way. This rental definitely beat out any hotel we could have stayed at in York! Stayed at The Willows for our daughter's wedding. Everything was top notch! Location is perfect for walking to town to browse the shops or walking in the beach. We were very impressed by the fully stocked kitchen, and everyone said their rooms were clean and comfortable. Couldn't have asked for better!